I love sorbet since it's usually made from yummy fruit and is dairy-free. I had a bag full of cranberries in the freezer leftover from the holidays and since I wasn't in the mood to bake, but still wanted to use the berries, I made this sorbet. 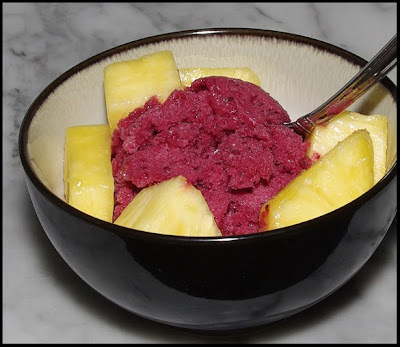 I used less sugar than the recipe called for since I knew I was going to serve the sorbet with some wonderfully sweet pineapple. This sorbet is so refreshing and would make fabulous smoothies or even cocktails. Here's the recipe for the sorbet. That looks delicious! Our temperatures are finally above 60 and it's almost ice cream weather! (I just can't bear to eat ice cream when it's freezing outside). sorbet has got a beautiful colour from cranberries.. pineapples adding to it..
Wow! What a wonderful, delicious, healthy looking treat! I love sorbet, too...I don't have an ice cream maker but they turn out pretty well anyway. So healthy! I have one of those bags of cranberries...I love cranberries, thanks for the great idea. Completely WOW! What a treat! I love sorbet, this cranberry version looks a treat. It looks so good with the pineapple. What a pretty color! What a great idea to use up extra frozen cranberries! I will have to check and see if I have any left in the freezer. Your sorbet looks amazing and so refreshing. Hi Michele, I've been replying to the comments you have left me on my blog via my comment notification emails and realized the emails I have been sending you have been going to noreply-comment@blogger.com. I don't understand this but thanks for your comments, I'm guessing you never received any of my replies? Oh, I wish I had some of this right now, Michele. What a gorgeous color combination! And the taste combo sounds great too! Wow! Thanks so much for all the lovely comments!! Stephanie--I didn't receive any of the mails!